It is hardly to be supposed that Tom Sopwith's pre-war dictum 'If you want speed the monoplane has it’ was the direct reason why the two above-named delightful little parasol machines were built, though Sopwith's French associations, stemming largely from that early love of his, the Bleriot, may have had something to do with the matter. However this may be, Harry Hawker's was the name most closely linked with 'Sopwith Monoplane No.1', as the Scooter was first known; for not only did he use it as a runabout (or 'scooter') after its completion in July 1918, but it was he who bought it in April 1921. By that time it had been registered to the Sopwith company, first as K.135, then in mid-1919 - as G-EACZ. To complete the peacetime history of the dainty little Scooter before describing its inception: after Hawker's death it was placed in storage until it was overhauled for C. Clayton of Hendon, the new C of A being dated 1 August, 1925. In August 1926 it was sold to Dudley Watt, who used it frequently until - after it had flown in the Lympne Open Handicap of 18 September, 1926 - it was sold as scrap in 1927. The Scooter's fuselage was that of a standard 130 hp Clerget-powered F.1 Camel; nor did the tail organs differ noticeably. The swept-back monoplane wing, however, was altogether new. It was mounted very close indeed to the fuselage (though in parasol fashion, as noted) on short splayed-out struts, and with a tall pyramidal cabane above these struts to anchor four landing wires which ran from its apex to the wing upper surfaces on each side. Below the wing, running up from the bottom longerons, were corresponding flying wires. So close was the wing to the fuselage that a trailing-edge cut-out was a necessity rather than a convenience. Yet even this 'mere civilian' on his 'pretty' Sopwith monoplane must have conceded some applause for the next item on the programme: the 'shooting-down' of a kite-balloon by a Snipe flown by Fit Lieut Hazell DSO, MC, DFC - pilot's war record, 34 aeroplanes and 16 balloons. This was especially true because in 1920 the Snipe was still the RAF's latest standard fighter; which brings us round again to the Scooter's lineal successor the Swallow. Now having already mentioned Sopwith's own French associations, and likewise - in a wholly different context - the aerobatic displays of Marcel Doret, one refers once again to a Dewoitine monoplane, though this time to the D.373, used in the 1930s by the French Navy as a carrier-borne fighter, in succession to another parasol-winged fighter, the Wibault 74. That these French machines were indeed the first carrier-borne monoplanes to be used as standard equipment by any of the world's navies can hardly be disputed. But that the Sopwith Swallow of 1918 was itself intended for deck-landing is, in itself, a fact of real historical significance, for it was built and flown a full five years before that other pioneer British carrier-borne fighter the Handley Page H.P.21. Over the Vickers Vireo of 1928 its lead was far greater. One other point of interest is that the very first Hawker (post-Sopwith) production - the Duiker reconnaissance aircraft of 1923 - was of parasol-monoplane form, though this was not for Naval use as was its near-contemporary the Blackburn Airedale. As for the name 'Scooter', conferred on the Swallow's aviary-mate, this was already familiar when adopted, though in early postwar years small motor-cycles so named became popular, and in 1919 Granville Bradshaw, whose A.B.C. engines have prominence in this book, produced his tiny 1 hp Skootamota ('decades ahead of its time", to quote an expert view). 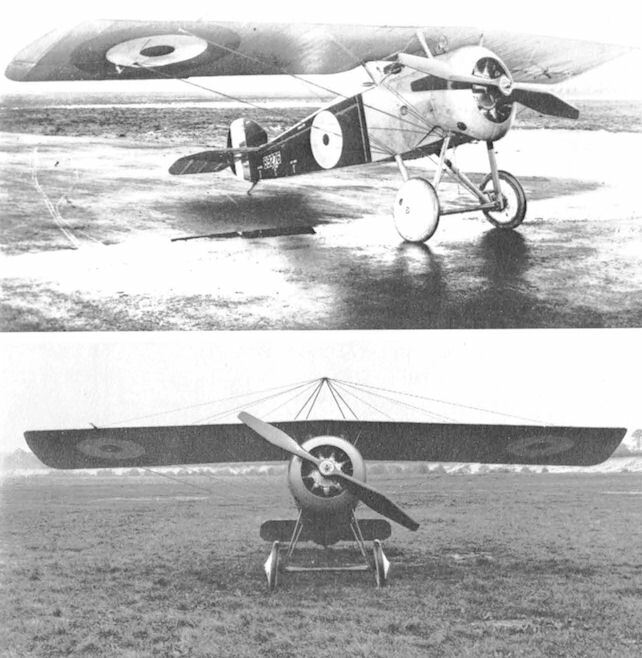 Although the Sopwith Swallow (completed October 1918) greatly resembled the Scooter it was, in fact, considerably different, having, in the first place, a wing of greater span and larger area a fact that might be related to the joint demands of shipboard operation and the fitting of armament. Even so, the area was much less figures being 162 sq ft (15 sq m) and 221 sq ft (20.5 sq m) - and this figure for the Camel was appreciably less than that for the corresponding land-based version. Stiffness was augmented by multiple chordwise external strips between the spars - to a greater extent than on the Buffalo biplane; the wing was higher set above the fuselage than on the Scooter, necessitating longer attachment struts beneath the landing-wire pylon; and partly by reason of a new wingtip shape, but also because of their greater span - the ailerons were increased in area. While the raised mounting of the parasol wing may in some measure have been dictated by considerations of pilot-view, this feature also allowed easier installation of, and access to, the two synchronised Vickers guns that formed the armament. These guns were more widely spaced than on the similarly armed Camel (thus further improving the field of view) and lay almost wholly exposed - certainly lacking the familiar 'hump' with combined large ejection chutes for cases and links immediately below them. Ring-and-bead sights were titled for Martlesham Heath trials. Apart from the gun installation and cowling, the Swallow's fuselage adhered closely to standard Camel F.1 practice (not 2F.1 be it noted, though with shipboard intentions still in mind, this point may be of scant significance for shorebased operation would hardly have been out of mind, and may, indeed, have dominated). Indeed, the Swallow which was sometimes called ‘Monoplane No. 2' still bore the number B9276, proclaiming its Boulton & Paul origins as one of a Camel F.1 batch. Nevertheless, the name 'Swallow' was applied in neat capital letters on the line of the top longerons just behind each roundel. 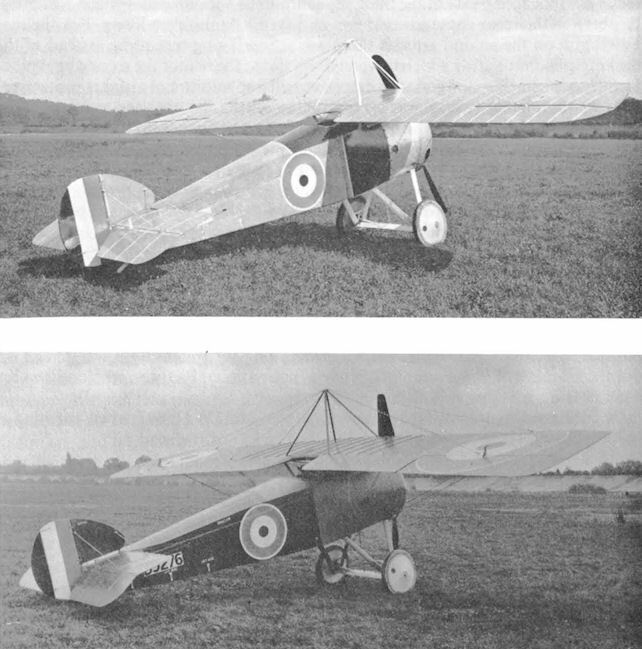 Having regard to the fact that the Camel airframe was fitted with engines of upward of 150 hp, overmuch may have been made of the fact that, as officially tested at Martlesham Heath (where it was delivered on 28 October, 1918) the Swallow was powered with a 110 hp Le Rhone - or, as Sopwith photograph-captions have it, a 110 hp Clerget. Development in the direction of the 230 hp Bentley B.R.2 (which was, in fact, used in the carrier-borne Nieuport Nightjar, before the arrival of the radial-engined Parnall Plovers and Fairey Flycatchers) could well have been intended, though this did not occur. That in round figures the Swallow proved about 5 mph slower than a similarly engined Camel is not. perhaps, as significant as it might appear (the propeller, for instance may have been a compromise between demands of speed and climb) though fuel-system trouble which delayed official trials had presumably been fully rectified. In any case, the official test report was dated May 1919; and that was no propitious time for ordering development and production of the RAF's first monoplane. Dimensions uncertain, but wing area about 135 sq ft (12.5 sq m). Maximum weight 1.300 lb (590 kg). Maximum speed approximately I 15 mph (185 km/h). Span 28 ft 10 in (8.8 m); length 18 ft 9 in (5.7 m); wing area 162 sq ft (15 sq m). Empty weight 889 lb (400 kg); maximum weight 1,420 lb (645 kg). Maximum speed at 10,000 ft (3,050 m) 113.5 mph (182 km/h); climb to 15,000 ft (4,570 m) 20 min: service ceiling 18,500 ft (5.640 m). Swallow. 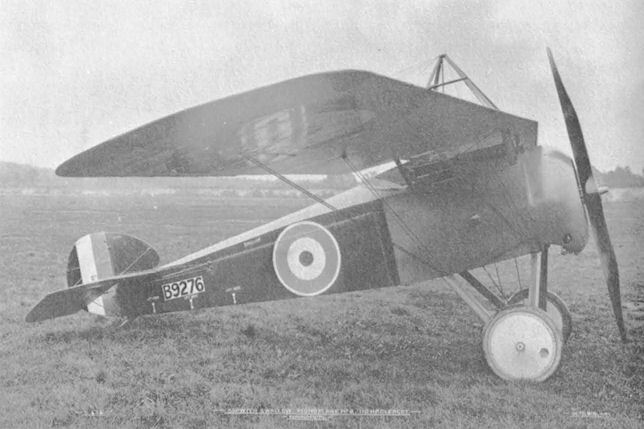 Although the Swallow parasol monoplane fighter, which appeared just before the Armistice, had a Camel fuselage, the two Vickers guns were rearranged. The hump was no longer in evidence, and the guns were more widely spaced, lying exposed along the upper cowling and having combined large ejection chutes for cases and links immediately below them. Utilising an F.1 Camel fuselage mated with a parasol wing, the Swallow single-seat fighter monoplane was powered by a 110 hp Le Rhone 9J nine-cylinder rotary engine and carried the standard armament of twin synchronised 0.303-in (7,7-mm) machine guns. Flown for the first time in September 1918, the Swallow was delivered to Martlesham Heath for official trials on 29 October 1918, remaining there until May 1919, the trials having been delayed by fuel system problems. The performance of the Swallow as revealed at Martlesham did not warrant further development, and the prototype was scrapped. Max speed, 113 mph (182 km/h) at 10,000 ft (3050 m). Time to 6,500 ft (1 980 m), 5.6 min. Empty weight, 889 lb (403 kg). Loaded weight, 1,420 lb (644 kg). Span, 28 ft 10 in (8,79 m). Length, 18 ft 9 in (5,72 m). Height, 10 ft 2 in (3,10 m). Wing area, 160 sqft (14,86 m2). The Sopwith "Scooter", a Monoplane "run-about" with a 130 h.p. Clerget. The company-funded, single seat Sopwith Scooter was the company's very first monoplane, the aircraft making its debut in June 1918. 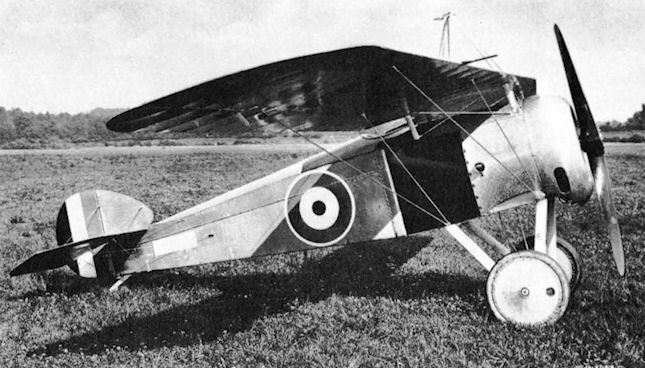 Purportedly built as an unarmed interim prototype for the Sopwith Swallow fighter, the Scooter actually served as Sopwith Test Pilot, Harry Hawker's personal aircraft. Powered by a 130hp Clerget, the Scooter used a Sopwith Camel fuselage. The sole Scooter never wore a military serial, its first identity being the civil K 135 seen here, later changed to G-EACZ. The sole Sopwith Swallow, serial no B 9276, photographed in October 1918. Employing a standard Camel fuselage, whose serial it used, the parasol-mounted wings had already been flown and tested on the Sopwith Scooter. Armed with twin, synchronised Vickers guns, the 110hp Clerget-engined Swallow had a top level speed of 113.5mph at 10.000 feet, some 7.5mph slower than the company's Snipe that was already in large scale production. The sole Swallow used the fuselage of a series Camel, with a new monoplane wing.